In the European Court¿s case law the special nature of Community is described in terms of ¿autonomy¿. 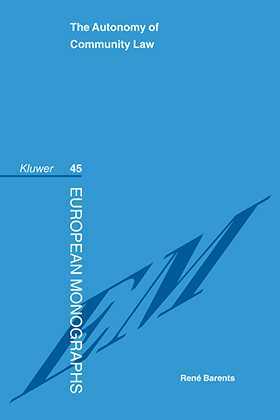 In this ground-breaking book, a major scholar of European law rigorously demonstrates that this concept arises organically from the origin, system and content of the European treaties; it is in fact an interpretation of Community law according to its own system, independent of national law. On this basis the book clearly explains what the special nature of Community law amounts to and the theoretical and practical consequences that follow from this interpretation. Professor Barents shows why Community law can be seen as a clear example of a new phenomenon: the emergence of non-national or global law, reflecting the reality that in the process of globalisation the nation-state begins to lose its control over the law applicable in its territory.